The remains of the Ashley Planes, an engineering work designed to move railroad cars over steep inclines, run through the mountain cut from Ashley to Solomon gap, south of US 81 and west of state route 309 along Solomon Creek. 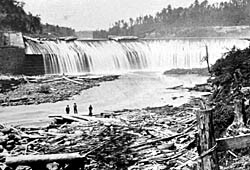 Construction of the Planes began in 1837 as part of the construction of the Lehigh & Susquehanna Railroad linking the Lehigh Navigation Canal with the Wyoming Anthracite Fields. Renovated and altered in the 1860s and in 1909, they eventually consisted of four separate inclined plane railroads used to connect Ashley with Solomon Gap, rising to an elevation of about 1,600 feet. 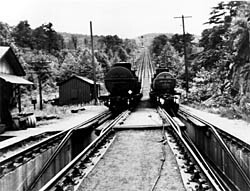 Both passenger and freight cars were raised and lowered along 5-15 degree inclines by cables powered by steam engines. The Ashley Planes were in use until 1948. They were a critical part of the passage from the third anthracite basin to Solomon Gap, and thence to all points south. Now in ruins, the remains of the Ashley Planes include the ruins of boiler, engine and drum houses; culverts, bridges, impoundments, and dams; and a village called Dogtown. Parts of the Ashley Planes are located on state game lands and are under rehabilitation as a hiking trail. Ashley Planes is located in the mountain cut from Ashley to Solomon Gap, lying south of Rte. 81 and west of Rte. 309 along Solomon Creek, south of Wilkes-Barre.